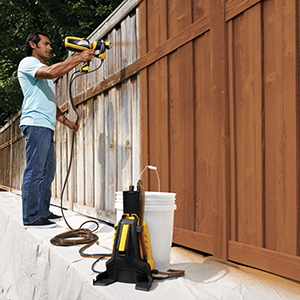 The FLEXiO® 990 direct feed paint sprayer is a complete painting solution with a direct feed spray system for continuous painting and small project painting with the provided nozzle. 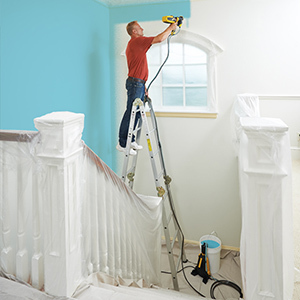 Pulling paint directly from any can allows for nonstop painting and faster completion with less mess. 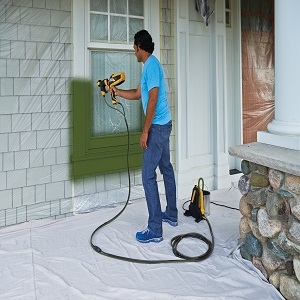 The FLEXiO 990 cordless paint sprayer provides flexibility for indoor and outdoor painting projects and the power to spray unthinned paints for full coverage with adjustable control and low overspray. 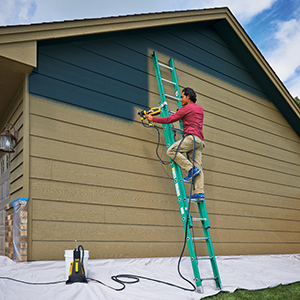 With air power, flow and pattern adjustments, the FLEXiO 990 is perfect for two-story homes, full interior remodels and outdoor projects. 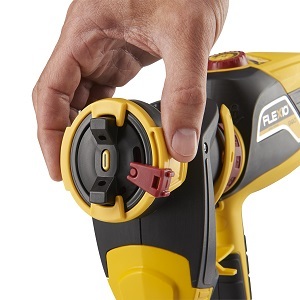 The accessory nozzle is ideal for finishing small projects, trim or touch ups. 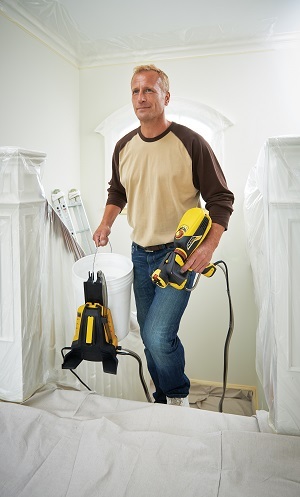 Features like onboard storage, one-touch setup and hands-free cleaning make the FLEXiO 990 DIY friendly. Flexio 990 Sprayer is rated 2.9 out of 5 by 21. 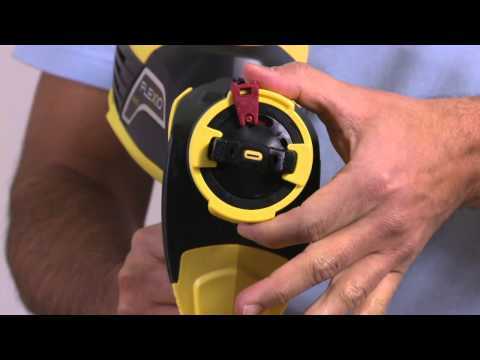 Rated 1 out of 5 by Painter 007 from Flexio 990 2 hours of use and the motor quits. NO PARTS AVAILABLE. Rated 2 out of 5 by Buschna from Wish it was better Bought this for a large project, had to rent a lift for the job. Did all my studying before I started, videos, instructions, tested with water, I was ready. The first day the 990 worked very well, I was pleased. However the second day it just quit before I could finish. The lift is only rented for one day so I had to go back to a pan and roller to finish my job. Tech support was less then helpful. Not at all happy with Wagner. Rated 4 out of 5 by apokluda from Works excellent after a bit of practice I read a lot of mixed reviews before purchasing the Flexio 990. When I tried it for the first time, I immediately understood a lot of the complaints, but now that I've had some practise, it works really well. The main complaints that I read about were paint leaking from the tip and globs of paint splattering on the wall instead of a fine spray and I experienced both the first time that I used it. However, when I was cleaning the sprayer for the first time, I immediately understood what the problems were and made sure that they didn't happen again. 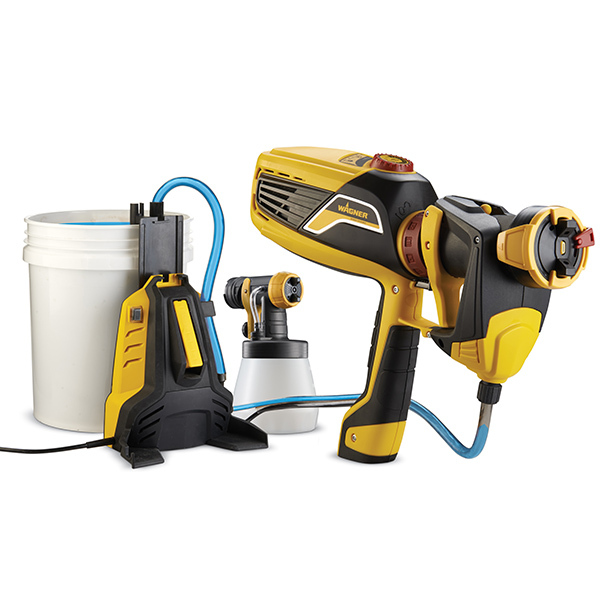 I was using the Flexio 990 to prime new drywall in my basement, and after I had done the first room, there was a small amount of fine splatter dried on the front of the sprayer. Then, when rotating the yellow ring to change the spray pattern from horizontal to vertical, the dried splatter meant that the yellow ring didn't move freely and I accidentally loosened the black nut on the front of the sprayer when turning yellow ring (which I realized later). This made paint leak from the tip, even when I wasn't pulling the trigger and made a huge mess. However, I realized at the time that if I turned the yellow ring back so the spray was horizontal, it no longer leaked (and again tightening the black nut without realizing it). So I did that and carried on painting. However, not long after I started to get a very uneven spray pattern and then just giant globs splattering on the wall. The problem was that when I loosened the black nut, paint had gotten all over the front of the spray nozzle and inside the spray gun, then dried to block some of the air holes. After the globs of paint tried, I tried to sand them but it was very difficult. In hindsight, I should have grabbed a roller and smoothed them our or a rag and wiped off the excess paint before it dried. There are also a few areas were I sprayed the paint too thick before I got the hang of it. However, now that I've had some practice and used it a few times, I am able to get excellent results at least as good as a brush and roller (if not better) in a fraction of the time. Cleanup is also a breeze now that I know what I'm doing. Instead of flushing the pump and hose with water three times for 5 minutes each time as the instructions say to do, I simply fill a 5 gallon bucket with warm soapy water and have it pump the water through the system and into a utility sink. It flushes the system with less time, less effort, and less water. Two buckets would work just as well... you could probably use the belt hook to help hold the nozzle over a second bucket. Speaking of the belt hook, it could be improved too. It would be good if there was a little catch on the bottom of the tabs that go over your belt, since almost every time I tried to lift the sprayer out of the belt hook, the whole thing slide off my belt. The elastic attached to the carry handle that is used to hold the tubing when being stored also caused problems when trying to slide the bucket hook up and down. I solved this problem by pulling the little loop of elastic up through the handle and leaving a bit of slack behind the handle when it was snapped into its spot behind the bucket hook. 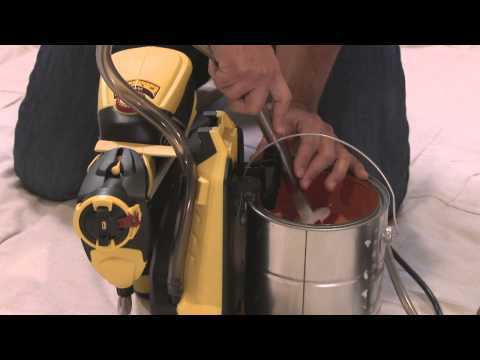 Rated 1 out of 5 by PhillyMike from Motor Failure I bought this sprayer just over a year ago and used it to paint a few large rooms and it worked great. I cleaned it per the instructions and stored it. I took it out yesterday, painted another room and cleaned as directed again. This morning, I finished up painting and the motor failed when flushing the lines. Technical support said the thermal switch probably went and there was nothing you could do about it. This was a $250 sprayer that I was able to use 2 times and there is no way to fix it! Terrible product! If Wagner can refund, repair or replace my product, I would consider their products in the future. Otherwise, this experience with the Wagner brand was terrible and would never recommend them to a friend. Rated 1 out of 5 by Kardaro from Perfect Advertising for "junk" I bought a Fexio 990 because I was guaranteed that this could paint thick liquid. Turns out if the, if all the components are working this is a great product. I painted half my house with this and it did a very good job as expected. You have clean this gun several times after use, however this last time that I used it seemed to strip the gears. Never had any problems before and cleaning it twice for 15 minutes seem to do the job. However this time I went to the gun and the gear sounds like there stripping. So I contacted Wagner and the place where I bought it from and because it's been past this year mark I'm unable to get this product replaced or fixed. I have offered to buy the pump or the part for the pump but the discontinuing of it forces me to have to buy another product all together. I just think it's funny that after the year mark this product quits working and nobody is able to solves problem without having to buy a whole new one altogether. I guess call me old-fashioned but when I buy something and take care of it expected to last or at least have a top name like Wagner back its product. Rated 1 out of 5 by Rand from Waste of time. I agree with another customer. Save your money. Will not recommend this item. Rated 1 out of 5 by DaveCZ from Save your money Started out working as advertised. Used it to paint some bean bag boards I made, cleaned it and put it away for about a year. I bought a house that needed some work, specifically paint all around on the inside. Started out with the kitchen and painted all the cabnet doors I removed as well as a couple interior doors. I always take it apart and clean it as the instructions suggest. It’s really kind of a pain so I try to do as much as I can with each use. Problem with it though is when you’re not actually spraying the paint, the nozzle leaks and oozes paint down the front of the gun. If you let it sit long enough, a pool of paint accumulates around the gun and if you have the air jets positioned vertically, then you get clogged air jets which, seem to clog regardless, they just really get fouled up when it sits. After having paint leak al over my carpet, which I now have to replace, I’ve decided to only use it outside because of the incredible mess that it makes. I was pretty close today to just tossing it out, but I suppose I’ll keep trying to get done what I can with the new house until that day when I become too frustrated and throw it in the garbage. I’ve already hired painters to come finish the rest of the house. Buyer beware. Flexi 990 went well first use. Went to paint roof oil based paint. Ran well. Cleaned thoroughly. Water based paint next. Ran well. Moved unit. It started squirting paint everywhere. Cleaned again. Ran well. moved again. Cleaned it. Paint burnt motor. why? Thank you for your question and we are very pleased your Flexio 990 works well. Multiple reasons paint can get back into the turbine: 1. If you are tilting this gun pass the 45 degree angle or overhead for a long period of time, paint will slowly travel back into the turbine. 2. The iSpray assembly has a regulator which holding pressure and relieving pressure. If the pressure is not relieving properly then paint will get back into the turbine. Please give our technical support a call at 1-800-328-8251 and we will able to assist you. Having issues with my Wagner 990 after using it twice. The paint does not stop flowing through nozzle. We've tried all the ways to solve but it wasn't possible, so we would like to buy few parts. Can you please help us where we can get spare parts. After the unit has run, the cup of paint is under pressure. When the nozzle is away from the needle, breaking the seal, paint streams out. Try to tighten the retaining ring on the front of your sprayer. If this doesn't work, look at the nozzle to check for a break or cracks that allow it to flex. We have parts in stock at 1-800-328-8251. I want to paint interior of my house, and some DIY smaller project (paint fence, wood furniture in garage etc).Work speed isnt a issue than efficiency and reliability. Is possible to use &quot;handle extension (60cm)&quot; for painting high ceilings on W990 Flexio? 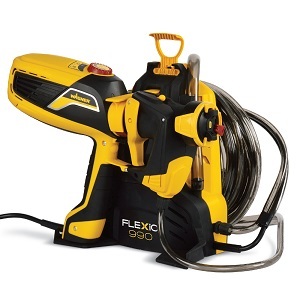 We do not have an extension for the Flexio line of HVLP sprayers. Call us for help deciding which sprayer will work best for your projects at 1-800-328-8251. There may be a problem with your regulator or it may just be loose. Call us at technical support for help at 800-328-8251. We'll figure it out together. Hello, thanks for your inquiry. I have sent a product manual to your email. It's the HD 2200 sprayer. For further help give us a call at 800-328-8251, have a great day! what's the difference between the 970 and 990 sprayers? The Flexio 970 is the new version of the older 990. We made some turbine improvements and we don't include the detail finish front end with it any longer, it is still available as an accessory. For more details call us at 800-328-8251. 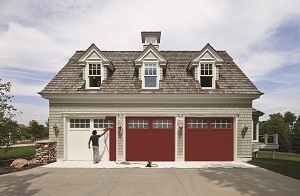 I used a wagner sprayer to paint my house including the eaves &amp; soffits, I then got a 990. I read the manual when I got it. Did some projects. Months later I start painting a ceiling, got it too steep &amp; the blower died. There ought to be a unit warning. The Flexio 990 is not meant to be tilted upwards past 45 degrees. It may damage the sprayer. You can contact our Technical Service at 800-328-8251 to see if there is anything that can be done. Thanks for contacting Wagner!